Similar to Chinese Pinyin Table, the Chinese Radical Table - Simplified lists all the radicals for the simplified Chinese characters. There are 214 radicals in the original Kangxi radical list, but a few of them are no longer used in the simplified Chinese. The list of Chinese radicals is a rough equivalent of a Chinese alphabet. They are used to index the characters for Chinese dictionaries. They are also building blocks of the Chinese characters and often reflecting some common semantic or phonetic characteristic. Knowing common radicals can greatly help you learn new Chinese characters. To look up a character, you can click the radical. 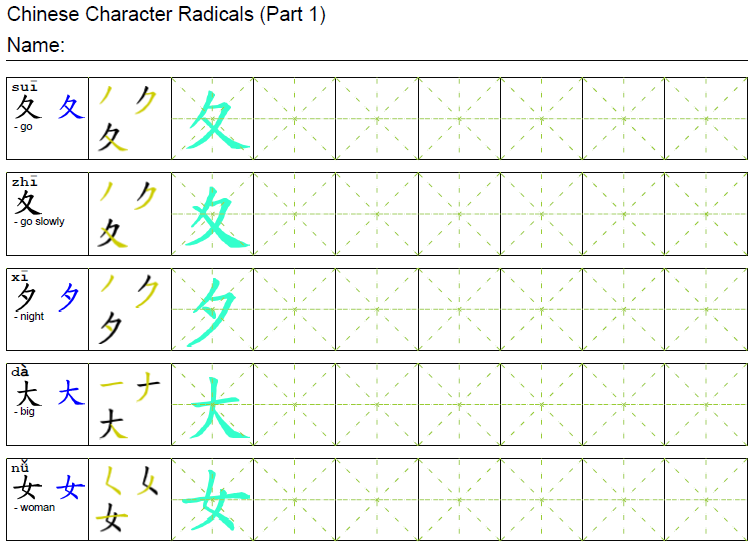 The system will navigate to the dictionary page and display all the characters with the same radical. If you know the Pinyin, you can use Chinese Pinyin Table to look up characters. To generate Chinese character radical worksheets for offline practice, you can go to the Chinese worksheets page, click the Chinese Character Radicals link on the side bar and press the Generate Worksheets button. If you are learning traditional Chinese characters, switch to Chinese Radical Table - Traditional.